A world where a few people have most of the wealth motivates others who are poor to strive to earn more. And when they do, they'll invest in businesses and other areas of the economy. That's the argument for inequality. But it's wrong. Inequality makes it harder for economies to benefit from innovation. However, if people have access to credit or the money to move up, it can offset this effect. 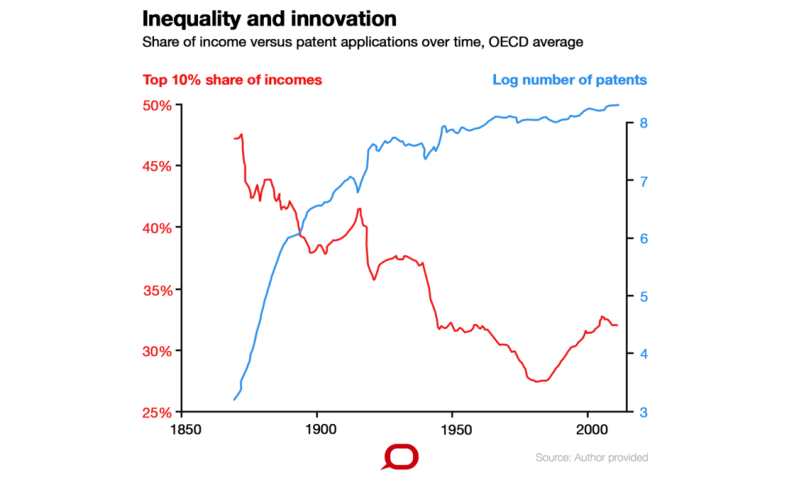 We measured the impact of this by looking at the number of patents for new inventions and then also looking at the Gini coefficient and the income share of the top 10%. The Gini coefficient is a measure of the distribution of income or wealth within a nation. From 1870 to 1977, inequality measured by the Gini coefficient fell by about 40%. During this time people actually got more innovative and productivity increased, incomes also increased. But inequality has increased in recent decades and it’s having the opposite effect. Inequality is preventing people with less income and wealth from reaching their potential in terms of education and invention. There’s also less entrepreneurship. Inequality also means the market for new goods shrinks. One study shows that if incomes are more equal among people, people who are less well off, buy more. Having this larger market for new products, incentivises companies to create new things to sell. If wealth is concentrated among only a small group of people, it actually increases demand for imported luxuries and handmade products. In contrast to this, distributed incomes means more mass produced goods are manufactured. What’s been driving inequality since the 1980s is changes to economies – countries trading more with each other and advances in technology. As this happens old products and industries fade while new ones take their place. These changes have delivered significant net benefits to society. Reducing trade and innovation will only make everyone poorer. 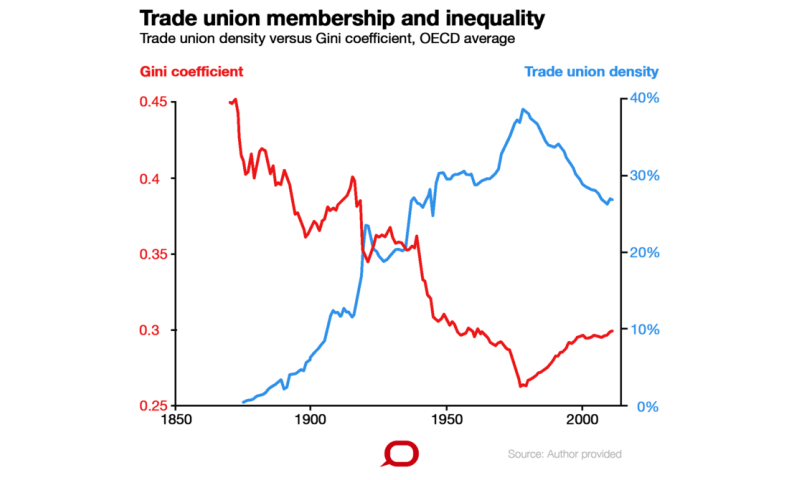 The declining number of people in unions has also contributed to inequality, as workers lose collective bargaining power and some rights. At the same time, unions can adversely affect innovation within firms. Unions discourage innovation when they resist the adoption of new technology in the workplace. Also if innovation creates profits for firms but some of these are taken up by higher wages (lobbied for by unions), these reduced profits provide less incentive for firms to innovate. Where workers’ jobs are protected, for example with union membership, there’s often less resistance to innovation and technological change. Most countries have much higher levels of inequality than the OECD average. This combination of high inequality and low financial development is a major obstacle to economic prosperity. When financial markets work well, everyone gets access to the amount of credit they can afford and can invest as much as they need. We found that for a nation with a credit-to-GDP ratio of more than 108%, low income earners are less discouraged by not having a share of the wealth. There’s less of a dampening affect on innovation. Unfortunately, most countries (including many in the OECD) are far from this threshold. In 2016, the credit-to-GDP ratio averaged 56% across all countries, and only 28% for the least developed. Until 2005, Australia was also below this threshold. This means governments should look at providing more people with more access to credit, especially to the poor, to stimulate growth. For financially developed nations like Australia, increased inequality actually has less of an effect on innovation and growth. So tackling inequality might not be as easy as increasing access to credit. Spending and taxing are already historically high and growing inequality makes it harder to further raise taxes. Countries like Australia are not unequal societies in the sense of having significant barriers to people improving their income. Australia is a relatively egalitarian nation. In 2016, the top 1% owned 22% of the wealth in Australia, compared to 42% in the USA, and 74% in Russia. Governments in more developed nations can instead try to maintain a stable financial sector to improve growth or by training and education.